I typically have babies and/or adult birds for sale throughout the year. Photos are provided for serious inquiries only. Pedigrees available as indicated. If you are seeking a bird that I do not have listed, please contact me to see if I have more in the nest box. I will also take orders for particular mutations should my pairs carry the genes necessary to produce what you need. Because I hold back some babies as future breeders, I often sell my proven breeders once they have produced a few clutches. Most of my breeding pairs are also tame, loving pets. If you are seeking proven or bonded breeders not on my Current Sales List, please ask. I do maintain a waiting list. I do not require a deposit for inclusion on my waiting list. I do, however, ask that you contact me ASAP if you have changed your mind and desire to be removed. Deposits are only refundable if I, the seller, cannot meet my obligations in the sale agreement. Buyer will be furnished with a receipt once full payment is made. Receipts for deposits or installments available upon request. My birds are available for viewing by appointment only. Most visits are scheduled on Saturdays between 10 a.m. and 8 p.m. Weekday appointments are only available between the hours of 6:30-8:30 p.m. Please contact if you are interested in one of my birds. All birds are guaranteed against any pre-existing conditions and or genetic deformities. To the best of our knowledge our birds should be free of disease or viruses, but we still strongly encourage the buyer have the routine preventative health screening that your attending veterinarian recommends. This guarantee is valid for 72 hours from the date of purchase. Any diagnosis of any pre-existing conditions must be made by a licensed veterinarian. TameTiels Aviary's attending avian veterinarian must concur with the diagnosis and all laboratory tests and results shall be made available to same. In the event of a loss due to a pre-existing condition, or genetic defect, TameTiels Aviary reserves the right to either replace the bird, based on availabilty, or issue a refund within 30 days of the remitted requirements. The buyer must submit the leg band and a written valid necropsy report from a licensed vet in the State in which the buyer resides. I am willing to deliver to certain areas of VA, DC, MD and NC for a minimal fee to cover travel expenses. 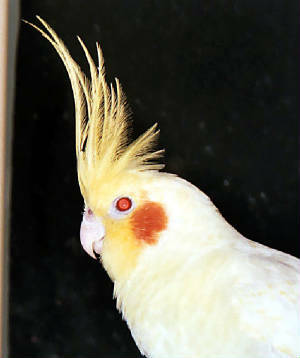 I am also willing to deliver to other states if I will be attending one of the NCS Cockatiel Shows in that area. I will only hold birds for such out-of-area deliveries with a 50% deposit (excluding delivery fees).